It can't have escaped your notice that many authors in the Wordy Wednesday interviews choose the delicious orange Jaffa Cake as their favourite biscuit. There was even a court case about the small round and biscuit sized snack, which determnined that, for tax purposes they were tiny flat cakes, not biscuits. Decided by the simple fact that a cake becomes hard when stale while a biscuit becomes soft. Test it for yourself, leave a jaffa cake uneaten for a few days out on a dish in the kitchen (no I have never managed this test either - the tax office must be very strong willed). But can we trust what the tax office says? After all, they said that Egyptian mummies were 'dried fish' for tax purposes, so there can be some debate as to their veracity. and therefore there will be no more acceptance of Jaffa Cakes as the favourite biscuit of authors. Thank you. @tattooed_mummy It's a biscuit dammit. You can dunk it in tea. Ok there we are, we can eat them, we cannot call them biscuits. Pop over and like my Facebook Page to join in a conversation about Jaffa Cakes, or some news story that catches my eye. Or Follow my meandering chatter on Twitter. Extra info about the law and why the debate matters : Under UK law no value added tax (VAT) is placed on biscuits or cakes. 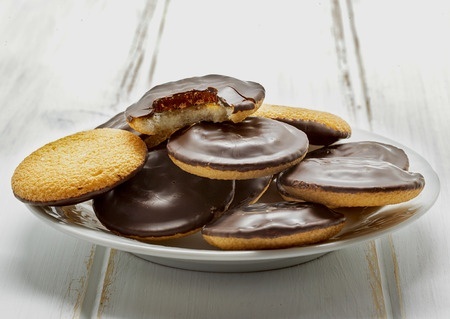 But critical to the controversial issue of Jaffa Cakes’ name, when a biscuit is covered in chocolate it becomes subject to the standard VAT rate, currently 20%.